Hey guys! Welcome to another Friday Feels where I share what I’m “feeling” this week. This post contains affiliate links. This week I’m feeling sluggish. Why is coming back to the real world so hard after a break? I’m this close to resorting to a bucket of water over my kids heads in the morning to get their buns out of bed. Even Charlie is giving me the stink eye when the alarm goes off at 6 AM. 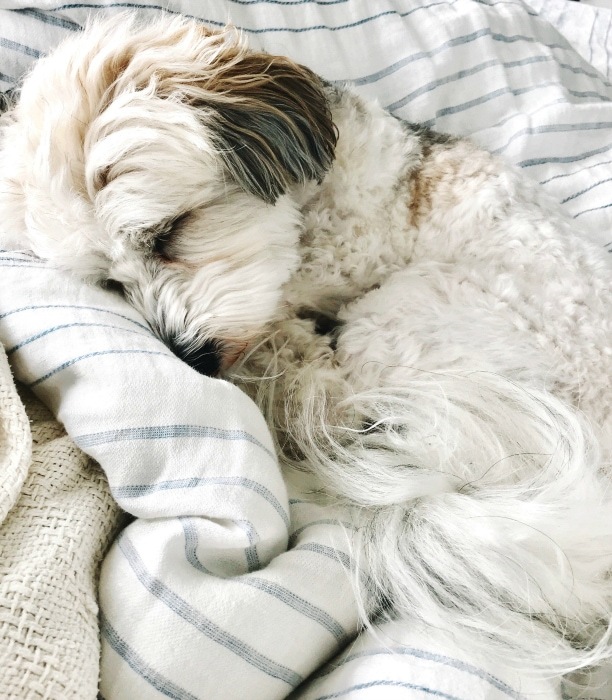 In the spirit of being half asleep, I’m sort of half arsing it today and sharing a bunch of random things I’m loving lately. I’m working on a little bedroom refresh to share on the blog in a few weeks. Although to be honest, I just planned to find new throw pillows and the whole thing has snow balled down to a new rug (story of my life oops!). In my defense, a few of the pillow covers on our bed are 10 years old (which is basically a blogger world record and also possibly gross?) not to mention Charlie has destroyed the knit blanket below (ok and he puked on the rug…), so it’s time. These pillows were the first snowflake in the bedroom makeover snowball, that I snagged at Target this week, I love that they are reversible. This blanket jumped in my cart too, which I used in my breakfast nook post earlier this week. It’s also spent some quality time on our couch in the living room, but I think it’s going to find its final resting place at the foot of our bed. 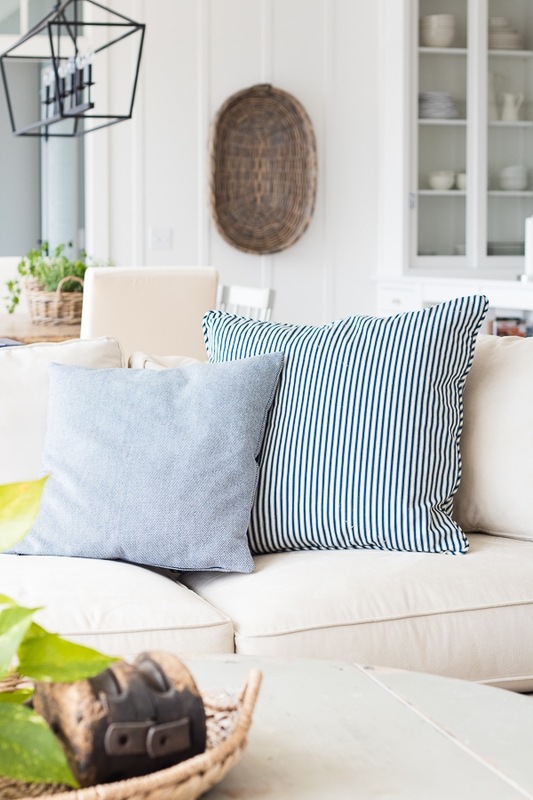 I also bought just a nice basic white duvet cover and these textured pillow shams from Pottery Barn because they are having a friends and family sale right now with 20 percent off and free shipping (use code FRIENDS). 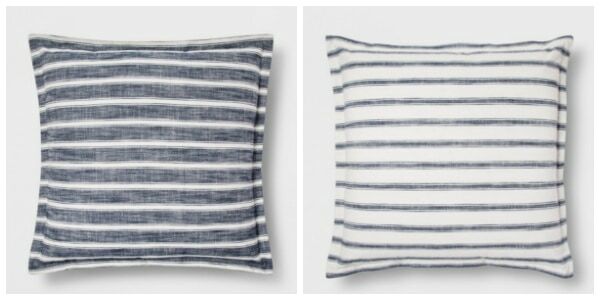 I get a lot of questions on these ticking pillows from Pottery Barn – they didn’t have them for a while, but I noticed they’ve recently brought them back. I think I have 4 or 5 of these because they mix and match so easily with other patterns. 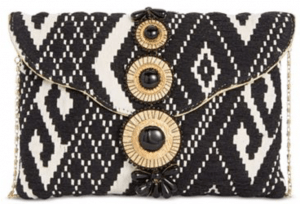 Random thought #2 – The Mr. and I are going to NYC next weekend for some business meetings he has, and I just picked up this cute clutch to take along. Love it! Random thought #3 – I bought this cookbook a few weeks ago and I have made a recipe out of it at least twice a week since buying it. Every. Single. Recipe. Is. Amazing. 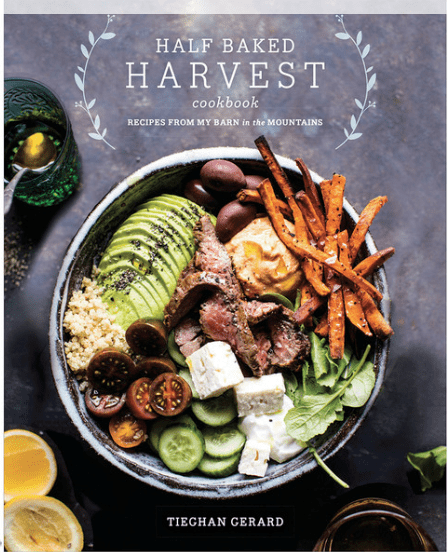 You can also read her blog Half Baked Harvest here, it’s one of my favorite food blogs and her younger brother is Red Gerard, who won the gold medal in snow boarding at the recent winter Olympics. How fun is that? Ok and last random thought – I picked up this Tartlette eye shadow pallet a few weeks back and I love (and use) every color in it. 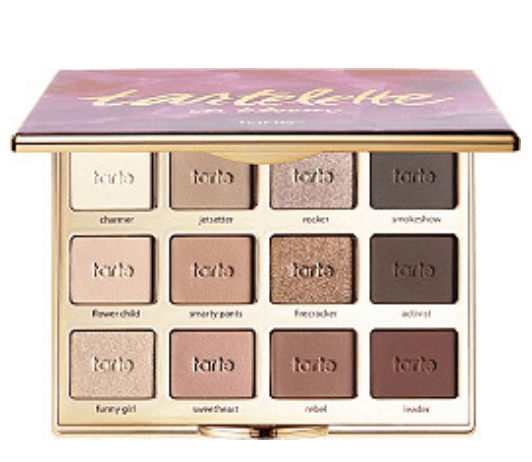 I love that it has a few shimmer options along with great matte colors. But it’s like grown up shimmer, not glittery 14 year old shimmer, I promise. How’s that for random? Happy weekend and happy sleep in Saturday tomorrow (which means 7:05 to my little kindergarten man, but I’ll take it)! I love it all!! But, especially your choice for ceiling fan!! Can you share make, model, where you purchased? Hi Susan, it’s actually just from Home Depot – last time I checked however that only had it in galvanized metal and don’t carry the white version. I just checked for the fan the other day. I was willing to drive over to the States from Canada to get it. But its been discontinued! So sad!! oh bummer, it’s so cute I wonder why they got rid of it?! It’s from Pottery Barn I think it’s linked on my shop our home page…if not I will try to get it on there for you! Just curious which color in the PB shams you decided to go with to coordinate with your bedding? Also, where did you find the cute smaller pillow that is next to the ticking pillow? It looks almost like denim maybe. The whitest ones, I don’t remember the color but they match perfect. I’ll be sharing the bedroom in a few weeks! That blue pillow is from H&M last year. It was $5! Hi!! Love it. 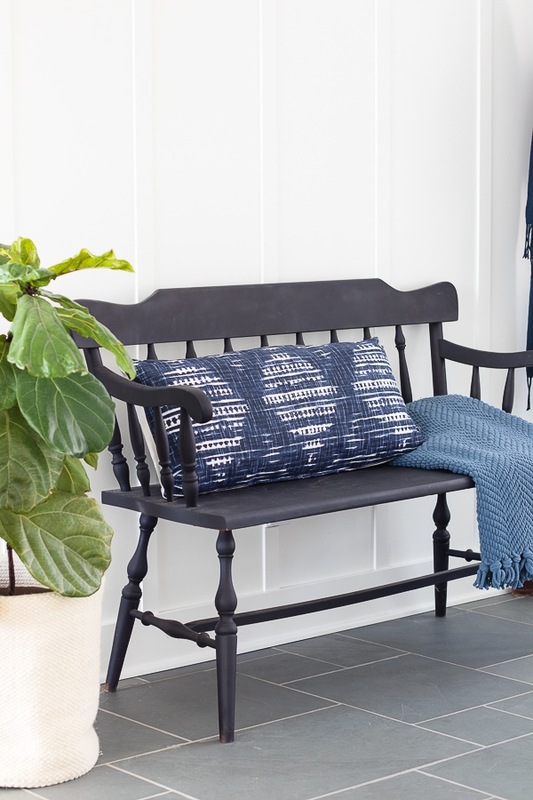 Where did you get the entry way bench? Hey Erica, it was a flea market find! $15 whoohoo! Oh good I’m so glad you found one, it will look great on your bed – thanks Dori! love the new pieces and the idea that is so uplifting for the days ahead. I’ve been looking for a new bed, a wood one and interested in information about the one you’ve featured in this Friday Feels posting. Hi Suzanne if you go to the shop our home page on my blog you should find a link to it, just click on the photo of it! Love the navy and black together! Thanks Lisa, he is such a snuggle bug! Team navy and black! Yassss! Yay someone else who likes to break the rules! Charlie is so adorable. 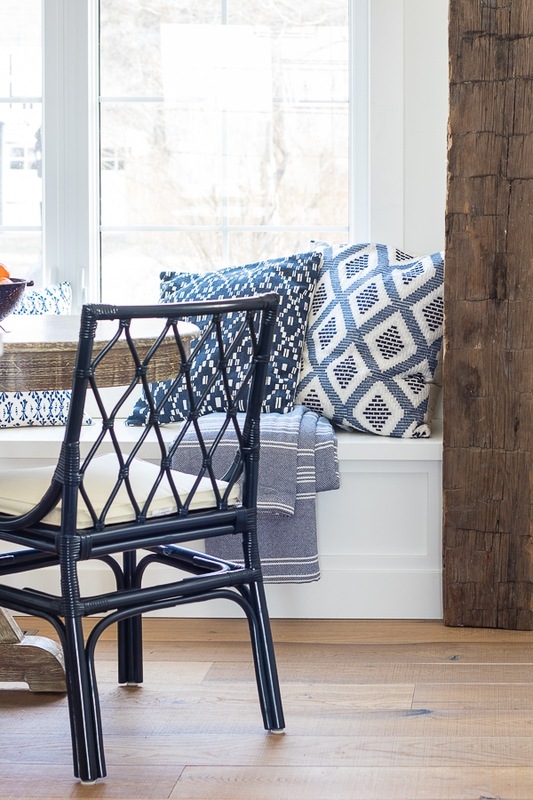 I love your home and style! Thanks Kelly, he is a sweetheart!